Dalloyau in Paris is renowned for their Gateau Opera, and I'm here to tell you why. But before I do that, how about a little backstory on the baker behind the cake? Dalloyau was founded in 1802 by Jean-Baptiste Dalloyau. He was no stranger to fancy food--both his father and grandfather had worked in royal kitchens. However, he was a visionary in that he was able to forecast that with the revolution coming and the end of court life, there would be a rising interest in food from the middle and upper classes--and he was there to feed them, with his concept of a "maison de gastronomie" which specialized in takeaway dishes that could be prepared by cooks. Well, the concept certainly took off, and Dalloyau began to create quite a nice niche for itself. And pastry and sweets were a big part of it--according to the Dalloyau website, in 1883, founder Jean-Baptiste's great grandson, Achille Henri Dalloyau created the first modern ice cream store--and established the pastry union. 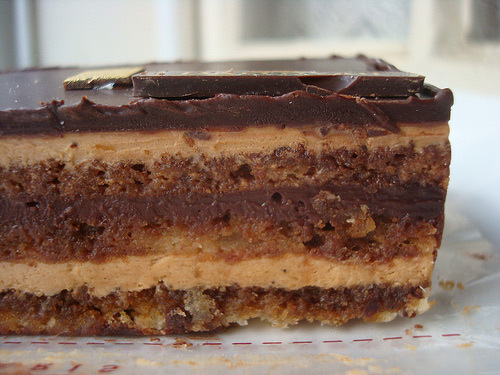 The elegant opera cake premiered as the Clichy, introduced by Louis Clichy, with his name written across the top, at the 1903 Exposition Culinaire in Paris. 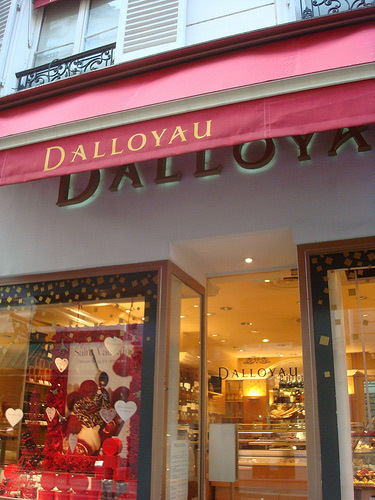 Years later, the renowned Parisian patisserie Dalloyau reintroduced and popularized it as L'Opera. This classic gateau is composed of exquisitely thin layers of biscuit viennois soaked in coffee syrup and then layered with coffee-flavored buttercream and bittersweet chocolate ganache. The top of the cake is iced with a very thin chocolate glaze, creating a pleasantly firm texture. This cake is traditionally square or rectangular with the sides of the cake exposed to reveal its tempting layers. And Dalloyau's storied version is very, very good. The rich coffee flavor infuses every bite, adding a deep, dark layer of flavor to every other piece of it: the biscuit, the chocolate, and the rich, smooth buttercream. Not to get too poetic about it, but this is sort of the kind of dessert that makes you want to close your eyes and say "mmmm" for a very long moment. Today, Dalloyau today is comprised of over 500 employees, counting amongst their ranks "97 cooks, 100 pastry cooks, chocolate makers, confectioners, 4 ice-cream makers and 4 bakers"--all the better to make more Gateau Opera to share with the world. Gateau Opera from Dalloyau, available at Dalloyau boutiques and cafes; for more information, visit dalloyau.fr.